You are here: Home / Health / Alternative / Essential Oil of the Month: Oregano! Essential Oil of the Month: Oregano! Oregano (Origanum vulgare) is a common species of Origanum, a genus of the mint family (Lamiaceae). It is a perennial herb, it has a pH range between 6.0 (mildly acidic) and 9.0 (strongly alkaline) with a preferred range between 6.0 and 8.0. The flowers are purple spikes. It is sometimes called wild marjoram. Oregano is an important culinary herb, used for the flavour of its leaves, which can be more flavourful when dried than fresh. It has an aromatic, warm and slightly bitter taste, which can vary in intensity. Good quality oregano may be strong enough almost to numb the tongue. Among the chemical compounds contributing to the flavour are carvacrol, thymol, limonene, pinene, ocimene, and caryophyllene. Hippocrates used oregano as an antiseptic, as well as a cure for stomach and respiratory ailments. A Cretan oregano (O. dictamnus) is still used today in Greece as a palliative for sore throat. Oregano is high in antioxidant activity, due to a high content of phenolic acids and flavonoids.In test-tube studies, it also has shown antimicrobial against strains of the food-borne pathogen Listeria monocytogenes and potential anti fungal activity. 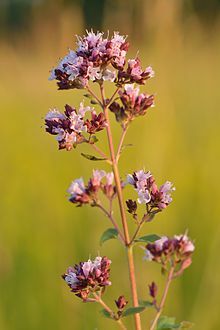 In the traditional Austrian medicine Origanum vulgare herb has been used internally (as tea) or externally (as ointment) for treatment of disorders of the gastrointestinal tract, respiratory tract, and nervous system. It has strong immune-enhancing and antioxidant properties and supports the respiratory system. Oregano may also be used to enhance the flavor of food. Oregano is also a key oil used in the Raindrop Technique, a massage of essential oils, which is designed to bring about electrical alignment in the body. Aromatherapy: Oregano essential oil is invigorating, purifying and uplifting. Blends well with: Cedarwood, lavender, lavandin, rosemary, thyme, marjoram, spike lavender, pine, camphor, citronella. Do not take the essential oil internally. « My Favorite Evil Queens!